A couple of weeks ago, we told you Google is working on a new href lang webmaster feature that Google would not disclose. In fact, Google was asking for beta testers to sign non-disclosure agreements, if they wanted to participate in the beta. Well, the cat is out of the bag. 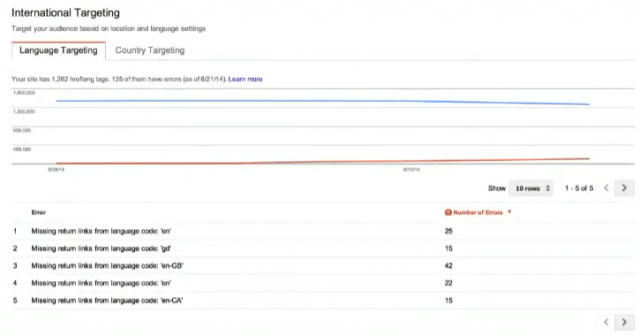 In last night's Best practices and common mistakes in SEO Google Hangout session hosted by three Googlers, Google showed off the new tool in Webmaster Tools. Menashe Avramov spotted this in the video and posted the details at Google+. As we thought, it is a reporting tool for showing you common issues with your implementation of href lang. The new report is named "international targeting" and shows specific issues that you can fix, and where the errors are. From missing return links from specific language codes, to unknown language codes in general.